Location Шипка | Imprint.BG - the only producer and operator of the popular souvenir machines for Bulgaria. The machine will not be placed for this season. Today Shipka is in quiet. The once battlefield has been turned into an open-air museum – the National Park-Museum “Shipka”. It was created in 1956 and encompasses the area of the historic places related to the defence of the Shipka Pass during the Russian-Turkish War of 1877/78. It is a complex of monuments, reconstructions of positions, batteries and dug-outs. The first monuments were Russian and were built in 1878-1881. The Bulgarian monuments on the Shipka battlefield are of the 3rd and the 5th bodies of volunteers (1910) and the Monument of Freedom on Sveti Nikola peak (nowadays Shipka peak), unveiled in 1934. 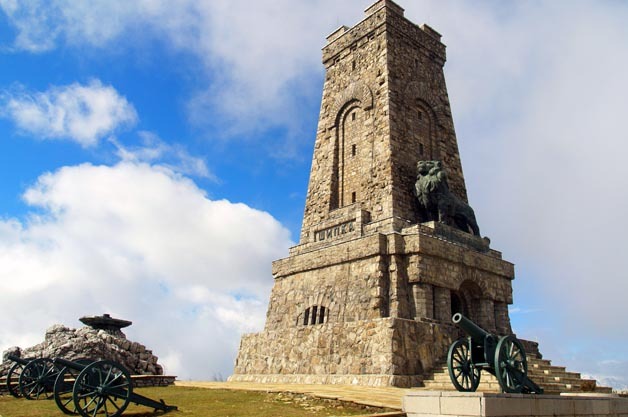 Each year on 3 March and in August of Shipka thousands of Bulgarians gather to commemorate the fallen heroes and to celebrate the victory that bore the freedom of Bulgaria. The Shipka peak is 28 km distant from the town of Kazanlak, and 22 km from the town of Gabrovo. Comfortable bus transport is provided from both towns. The access to the National Park-Museum “Shipka” is very much suitable for car tourists. The numerous cafes and restaurants in the area are also available to the visitors, as are two hotels.